These poems were written as I was recovering from a motorcycle accident. I learned that to survive a trauma one needs two things; a sense of humor, and sense of self. Stories give us both of these. When I can tell a story of something it doesn’t control me anymore. Stories ask the big questions; where we come from before life, where we go after death, what is sacred, what is funny, and then even if the answers aren’t discovered, by the asking we know we’re not alone. 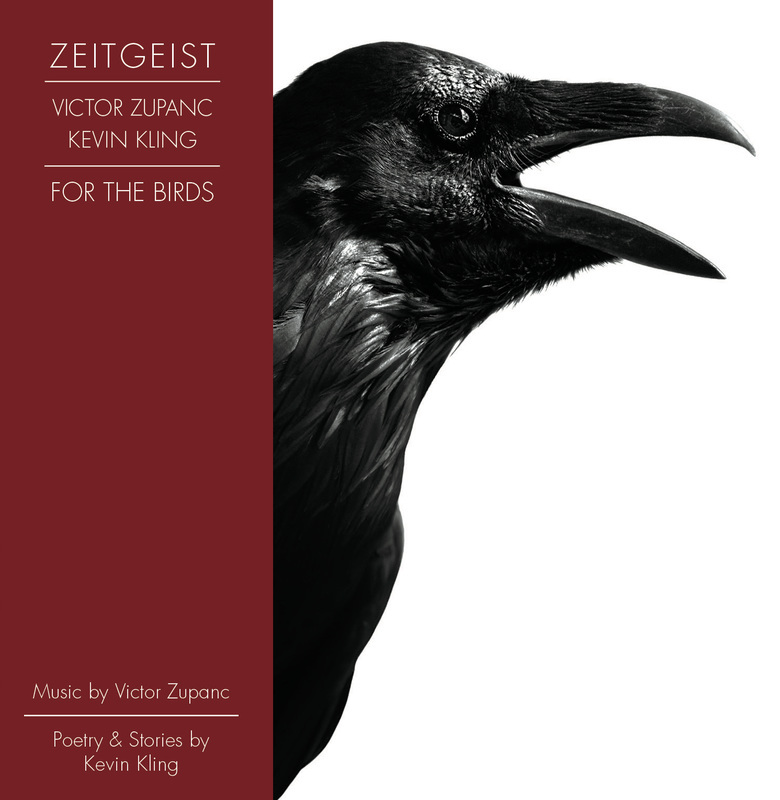 I am especially thrilled to be working with Victor Zupanc and Zeitgeist on this project. I admire them greatly as artists and innovators and am very moved and impressed by their musical interpretation of these poems. Ever since I met Kevin Kling in the 1990s I have had the joy of observing the many, many virtues that pour daily from him including courage, humility, confidence, fear, honesty, determination and an unending generosity of spirit. He has always been a huge inspiration to me. When Kevin gave me these poems to look at several years ago and told me they were about various birds that he had observed while recovering in a hospital room I was immediately intrigued. When I read them I found a body of work that exhibited all of the aforementioned traits of Kevin’s and much more. These poems, for me, are about life and death, about sickness and health, about joy and fear. When a hawk dives to the ground and picks up a mouse the event is both tragic and jubilant depending on the perspective. Joyful for the hawk who’s about to feed his newborn chicks but tragic for the mouse who will never again see his babies at home. These poems speak honestly and transparently about strength and weakness, sadness and joy, about hope and uncertainty. They are about birds and also very much about humanity. In setting these poems I tried to create music that would honor and highlight and emphasize every nuance that I could glean from the words and the phrasing offered by Kevin. For me, musically, no style or influence was off limits. I wanted to create pieces that are uniquely individual, honoring each poem, but also a cohesive collection of pieces that are inseparable and flow from one to another informing the listener along the way. You will hear a multitude of styles and genres but also a vast trail of motifs that help to connect the dots. I knew from the beginning that Zeitgeist was the perfect vehicle to drive this piece. I also knew that I had to write Kevin and myself into the piece because that way I would get to perform with Zeitgeist and with Kevin Kling at the same time! And that is absolutely a dream come true. Scott Miller is a composer of electroacoustic, orchestral, chamber, choral and multimedia works described as ‘high adventure avant garde music of the best sort’ (Classical-Modern Music Review) and 'inspir[ing] real hope & optimism for the future of electroacoustic music.' (5against4.com). Known for his interactive electroacoustic chamber music and ecosystemic performance pieces, Miller has twice been named a McKnight Composer Fellow, he is a Fulbright Scholar, and his work has been recognized by numerous international arts organizations. Recordings are available on New Focus Recordings, Panoramic, Innova, Eroica, CRS, rarescale and SEAMUS, and his music is published by ACA (American Composers Alliance), Tetractys, and Jeanné. Miller is a Professor of Music at St. Cloud State University, Minnesota, where he teaches composition, electroacoustic music and theory. He is currently President of the Society for Electro-Acoustic Music in the U.S. (SEAMUS). He holds degrees from The University of Minnesota, The University of North Carolina - Chapel Hill and the State University of New York at Oneonta, and has studied composition at the Czech-American Summer Music Institute and the Centre de Creation Musicale Iannis Xenakis.